Many women are afraid of suffering from postpartum depression after the birth of a child, but none more than a mother who has already experienced it before. It goes without saying that any mother who has suffered from postpartum depression would never willingly want to put themselves through that kind of torture again. But while the idea of having another baby after postpartum depression feels like a suicide mission, a significant amount of women go on to have more children after being diagnosed. This means that, while it might seem preposterous at the time, there is hope for a full and bright future filled with all the children we dreamed of having. Here is my best advice for how to prepare for another baby after you’ve suffered from postpartum depression. If you don’t already have a treatment plan for your postpartum depression, then establishing one is the first step. Once your treatment plan is in place, don’t deviate from it – even if you start to feel better. If you never initially sought treatment for your postpartum depression but feel like it is under control – it is still worth seeing a doctor, therapist, counselor or other health professional to discuss your options should you experience a relapse of symptoms. Is your treatment plan safe for pregnancy and/or breastfeeding? Many women avoid pharmaceutical treatments because they want to continue breastfeeding (myself included) and most women avoid pharmaceuticals during pregnancy due to the lack of testing. So if your normal treatment plan includes anti-depressants then you may need to create a back-up plan. There are many other safe and natural treatment options available can help to reduce some of the guilt that so often affects mothers who give up breastfeeding in order to take anti-depressants. Online therapy is a great option to consider if you’re unable to use medication to treat your postpartum depression. Make sure to talk to your doctor about your current medications if you are planning to have another baby. In the post How to Avoid a Postpartum Depression Relapse I list off some common triggers and how they cause symptoms to reappear long after treatment has begun. Before adding a new baby to the family, it’s worth considering what triggers your postpartum depression symptoms and trying your best to eliminate them ahead of time. Tracking your mood fluctuations can help you identify specific patterns and triggers. Financial or marital problems should be worked out in order to avoid added stress. Illnesses, chronic pain, nutrient deficiencies and the overall state of your health should be addressed. Practicing yoga and meditation can be a great way to get in better physical and mental health prior to having another baby. While many triggers will be unavoidable, if you can be in good physical shape and proper mental health prior to getting pregnant again, then you will be more prepared should postpartum depression strike again. Writing down everything you’ve gone through can help you to remember what your experience was like at a later date. Sometimes the things we feel in the heat in the moment can easily be sorted out when our mind is clearer. If you wrote down any of your thoughts or feelings in a journal of some sort during your first round of postpartum depression, then you should take some time to re-read those entries prior to have another baby and see if they give you some insight. If you do end up struggling with postpartum depression again after another baby, then document your feelings again so that you can compare both experiences and see if there is a common factor or trigger that you can work on. I know, I know, I’m always talking about how women need to speak up about postpartum depression… but it really makes all the difference! There are so many reasons why we keep silent about postpartum depression but if we stand any chance of defeating it and avoiding it again, then people need to KNOW about it. The more we talk about it, the less taboo it becomes. We need to stop living in the shadow of postpartum depression – it’s the only way we can eliminate it’s power over us. If you’re thinking about having another baby after postpartum depression, then everyone in your life should already know about your previous battle with postpartum depression. It shouldn’t be a shameful secret, but rather a badge of honor. In addition to your loved ones, your doctor or midwife should know that you suffered from postpartum depression with a previous baby if they don’t already. Knowing that you have a support system already in place in the event that you suffer the same unfortunate fate again, will help you to prepare for having another baby after postpartum depression. Why do you want another baby? Is it because you’ve always dreamed of having more? Do you feel like you need to provide a sibling for your child to grow up with? Does your spouse or partner want another baby? Do you feel your biological clock ticking? I’m not saying that any of these reasons are wrong reasons to have a child, as long as it’s what you really want. If you feel pressured in any way to have another baby, it might be time to do a little soul searching and think carefully if the time is right. I can give you thousands of tips on how to prepare for another baby after postpartum depression, but unless you are ready – none of them will help. Speaking up is only the first step to battling postpartum depression. If it has affected your life – don’t let it get away so easily. The best way to fight against postpartum depression is to take a stand and help destroy the stigma that surrounds it. Participate in this free Postpartum Depression Research Study to help determine the genetic link. The more you know about, and are involved with the postpartum depression community, the better you will be at defeating at. The truth is, if you’ve suffered from postpartum depression before, the chances of suffering from it again are high. While you may not be able to avoid postpartum depression the second time around, being prepared and educated will help you handle the symptoms and know when and where to turn for help. Postpartum depression isn’t a matter solely for mothers of newborn babies. It’s a lifelong struggle. Even with treatment, a postpartum depression relapse can happen years after the sleep deprivation and breastfeeding days are over. The best way to describe it is to imagine that a depression gene is lurking somewhere within you. In some people, it is never triggered and lays dormant their entire life. In others, it’s triggered during childhood or puberty, from a traumatic event, or by pregnancy and childbirth. The problem is, once it’s triggered, it’s more likely to keep happening. Treatment can manage the symptoms and controlling specific triggers can help to avoid relapses. But it’s not something that is ever cured, and it will never go away because it was always there to begin with. It can only be controlled. Here are some tips to help you avoid a postpartum depression relapse. Find out what factors tend to make you feel more depressed. Keeping a journal can help with this. On days when you are feeling extra sad or anxious – write down things you’ve done recently, how you were feeling, conversations you had, medications you’ve been taking, what the weather was like, and so on. Postpartum depression triggers can be different for everyone. 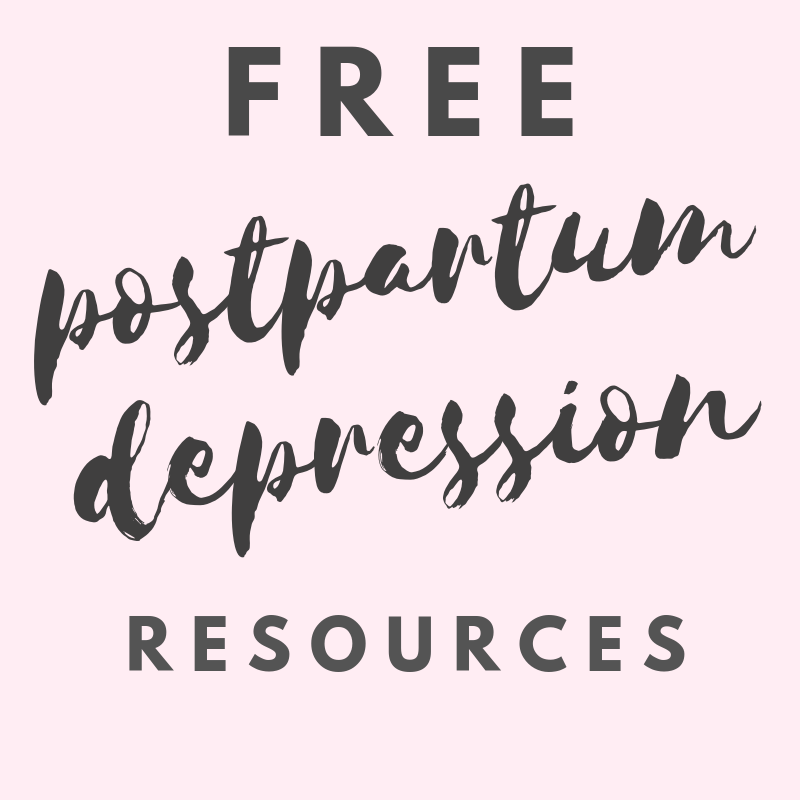 You can download this free printable postpartum depression workbook which contains a section to document specific triggers. I know, it’s easier said than done. If we could all get rid of pain and stress, then the world would be a better place. Try keeping track of your sleep patterns and monthly mood fluctuations to help you notice patterns and triggers. But once you’ve identified your specific trigger(s), your next goal will be to work at ways to fix that issue in your life. If you’re uncertain of where to begin to fix the problems affecting your mental health, then speaking to a therapist can help. Sometimes, it’s difficult to determine the root cause of our symptoms on our own. Cognitive behavior therapy is a great exercise to help with this. There are also licensed online psychiatrists available that you can have video chat sessions with. Mothers are infamous for not taking proper care of themselves. Self care is not just a suggestion, it plays a huge role in avoiding a postpartum depression relapse. Taking time to relieve stress, sleep well, eat properly, exercise and meditate will ensure that you stay one step ahead. You can even create your own, dedicated self-care space to escape to when you start feeling low. Try this 30 Day Self-Care Challenge from This Mama Needs Chocolate! Of course you’re going to be feeling great after starting a round of anti-depressants or therapy, but that doesn’t mean it’s done it’s job and now you can stop. Any changes to your treatment plan should always be discussed with your doctor, don’t assume that you no longer need treatment just because you’ve been free of postpartum depression symptoms for months. Seeking treatment for postpartum depression is important. Don’t assume that it will go away on it’s own. Getting an official diagnosis of postpartum depression can be empowering. Knowing that you suffer from a mental health condition can validate everything that you are feeling and help you to accept that this is not your fault. If you didn’t tell anyone you had postpartum depression the first time it happened, then it’s likely you will also choose to suffer silently in the event of a relapse. Find someone that you can talk to about your feelings. It can be someone close to you, a complete stranger or a support group, as long as they will encourage you to speak up and seek help. As much as you might try to eliminate stress and other triggers, life still happens and much of it is out of our control. Try your best to plan ahead for situations that overwhelm you. If being locked inside the house during the winter months makes you feel dreary, plan a vacation. If you’re dreading the stress of juggling all the kids during summer vacation, hire someone to help you. Being prepared for a postpartum depression relapse may even be enough to make you feel like you can handle it, should it hit. Sometimes, having a postpartum depression relapse is unavoidable. It doesn’t mean that you have failed or that you will never get better. While you may suffer more relapses in the future, each one will be easier to get through as long as you don’t let it get the best of you. While postpartum depression is a long term battle, it doesn’t mean that you will need to fight it forever. With the right treatment, you can live symptom free. As long as your postpartum depression is a secret – it controls you. If you’re constantly afraid of a relapse happening, then it has power over you. The only way to take away it’s power is by accepting and acknowledging it. Tell everyone that you have postpartum depression and that there’s a chance you could suffer a relapse. Then you won’t have it hanging over your head, and you won’t have to suffer alone. Consider becoming an advocate for postpartum depression awareness, joining a maternal mental health movement or blogging about it. If you didn’t know that a postpartum depression relapse was even possible, then chances are, neither did they. “They” being your loved ones, your spouse, family or friends – even your own children. Once you start feeling better, others will assume that you’re cured. And if you suffer a relapse, you will be reluctant to tell them for fear of disappointing them. But it’s not about them, it’s about you and your health, and that’s far more important. So before you even suffer from a relapse, tell your loved ones that it’s possible this could happen. Ask them to help you eliminate your triggers and watch for symptoms that your postpartum depression is returning. Don’t feel guilty or selfish because this is your life. It might be in a mother’s nature to put others before themselves, but when it comes to postpartum depression – you come first. Contrary to popular belief, postpartum depression does not go away on it’s own. And a postpartum depression relapse does not only happen when you have another baby (although that can be a trigger). Many mothers find themselves battling the symptoms of depression years after giving birth. It’s discouraging and annoying and definitely unfair, but with the right self care routine and treatment plan, it doesn’t have to ruin your life. Ultimately, the worst thing you can do about it, is nothing.